At first glance, the biggest beneficiaries of prevailing wage laws would seem to be nonunion construction workers employed on state construction projects. Unionized workers, one might be inclined to think, would have little to gain, because they receive union wages on every project. But the observed effects of prevailing wage laws are different. In nine states that repealed their prevailing wage laws between 1979 and 1988, construction workers overall saw slight declines in their wages. The decline was far from evenly spread: Construction wages declined by 2 percent to 4 percent, but most of the declines actually occurred among unionized workers, who saw their wages drop by around 10 percent. Nonunion construction workers’ wages were fairly stable. A comparison of the Michigan Department of Labor and Economic Growth’s "prevailing" wages to the average wages found among nonunion contractors in Michigan shows that the minimum wages set by DLEG may be more than twice the average wage among nonunion contractors. In 2005, for instance, carpenters in the Midland-Bay City-Saginaw area earned an average of $17.65 per hour, including wages and fringe benefits, at merit shop companies, according to PAS Inc., a Michigan-based private company that tracks costs in the U.S. construction industry. But on state-sponsored construction, carpenters would have had to receive wages and fringes totaling at least $35.25 per hour — an increase of 99.7 percent. Construction laborers in the Midland-Bay City-Saginaw area earned $11.68 an hour at nonunion companies, but the 2005 prevailing wage figure from the DLEG was $27.17, or 132.7 percent higher. The U.S. Bureau of Labor Statistics, which surveys wages in 15 Michigan metropolitan areas, includes both union and nonunion employers in determining median wages. As a result, estimates from the BLS tend to be a bit higher than the average for nonunion contractors alone, but by the same token, BLS’ coverage of the entire labor market means that the bureau’s median wage figures should serve well as an alternative measurement of the true prevailing wage. ** The BLS figures do not include fringe benefits, while the prevailing wage rates issued by DLEG do include fringe benefits, so any comparison requires adjustments for fringe benefits. A review of PAS and U.S. Department of Labor data indicates that fringe benefits for union and nonunion compensation in the construction industry range from the teens to the low 30s as a percentage of base pay. Adjusting the BLS figures upward by 30 percent to account for fringe benefits,‡ a comparison of median wages in the construction industry in 2005 with the 2005 prevailing wage rates in Michigan shows that Michigan’s prevailing wage law resulted in an average wage increase of 39.1 percent. Source: U.S. Department of Labor, Bureau of Labor Statistics and Michigan Department of Labor and Economic Growth. Under this measurement, not all construction workers necessarily benefitted: Union rates for electricians in the Saginaw area in 2005, for instance, were essentially the same as the adjusted median wage reported by the BLS. 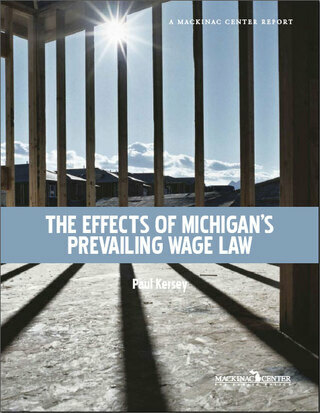 But the vast majority of workers appear to have received double-digit pay increases on prevailing wage work compared to BLS median wages; of a total of 156 measurements of workers’ wages spread over 15 Michigan metro areas in 2005, only 13 comparisons indicated that workers would not have received pay increases in excess of 10 percent. Some workers would have seen dramatic increases: Cement masons in the Ann Arbor area would have had their wages increased by 99.8 percent, from $21.91 per hour (on a BLS median wage of $16.85) to a prevailing wage of $43.76 per hour, while carpenters in the Muskegon area would have seen their hourly wages boosted from $14.00 (on a BLS median wage of $10.77) to $31.15, an increase of 122.5 percent. The cost of the prevailing wage law in 2005 varied from region to region. Wages in the Flint area would have received a boost of 20.4 percent, while in the Bay City area, the average wage boost would have been 66.8 percent. In the Detroit area, DLEG’s prevailing wage rates were on average 39.0 percent higher than the corresponding median wage found by the BLS after adjusting for benefits. Given these calculations with BLS and PAS figures, Michigan’s prevailing wage law and its requirement that union wages be used on state construction projects adds roughly 40 percent to 60 percent to the cost of labor. As a consequence, what Michigan law calls a "prevailing" wage is actually an above-market wage paid to a shrinking minority of construction workers. In the process, the state effectively subsidizes high-cost unionized contractors. Unionized companies with workers compensated well above average need not fear competition from companies that pay their workers a market-based wage when bidding on state-sponsored construction. * The figure for Hillsdale County probably understates the extent to which prevailing wages inflate labor costs. The average statewide merit shop wages include urban areas, where costs will tend to be higher, while the prevailing wages apply to Hillsdale County only. † The figures for each of the 25 categories in the three counties appear in Appendix A. ** It should be noted that the BLS figures include construction workers engaged in both residential and commercial construction. While it is possible that this might affect median wages for some categories, the effects seem to be minor. The overall results from the BLS comparisons are consistent with other measurements of construction industry wages and with the results of investigations of the effects of prevailing wage laws on the overall cost of construction. ‡ This 30 percent figure in most cases overstates the fringe benefits earned by construction employees working on private-sector projects. As a result, the disparity between prevailing wage rates in public construction and the wage rates in private construction projects will tend to be understated here. *** This figure represents the percentage by which the prevailing wage exceeds the adjusted Bureau of Labor Statistics wage.